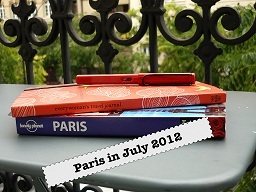 This entry was posted in Family History, Paris in July 2012 and tagged books, Paris in July 2012 by cassmob. Bookmark the permalink. Me too Joan..sometimes life just gets in the way. I’ve been reading books but got behind with blogs while interstate and struggling to catch up. At least you’ll have some nice brisk weather coming up in a few months. It’s been a hot one over there. Hello, I’ve loved most of Joanna Harris’s novels and find them quite mystical and atmospheric.. I’ve just started ‘Peaches..” and prefer it to Lollipop shoes whcih preceded it. I also enjoyed Coastliners, Jigs and Reels (short stories) and Blackberry Wine. Holy Fools is fascinating once you are more into it but I did decide that I probably wouldn’t like Runelight. I own some of these however I’ll use the library for more of hers now. Thanks Fiona…you’ve given me some tips too. I’ll have another crack at Holy Fools before I take it back to the library and will try to get hold of Blackberry Wine. Thanks.